"...You don't need to be in the arts, which does not have a monopoly on these scenarios, to enjoy this accessible, date-friendly show (assuming you like danger on your dates), which has the kind of dead-on dissection of the perils of male buddydom for which Neil LaBute is justly famous." "...In some ways, "The Four of Us" (the number in the title suggests that the two men are different beings before and after the arrival of success for one of them) resembles Yasmina Reza's play "Art." As with that popular 90-minute drama, this one left me thinking: Have you ever met any two guys who talk at quite such length with each other, and at quite such a level of intimacy? I doubt it." "...A metatheatrical element kicks in when we find out that David's written a play about those very experiences. It doesn't lead to much that's exciting, though. In the end we have to settle for the limited pleasures Moses provides, along with sharp performances by Usman Ally as David and Collin Geraghty as Benjamin in a solid production directed by Jeremy Wechsler." "... The production profits mightily from the spot-on performances by Collin Geraghty as Benjamin and Usman Ally as David. Geraghty is perfect as the aloof young man who explodes with hostility when he senses his friend is ridiculing him on the stage. Ally is equally good as David, wearing his feelings on his sleeve and never able to get a handle on his friend’s emotional disconnect in their relationship. Director Jeremy Wechsler does an insightful job of orchestrating the shifting tides of the friendship. Some scenes work better than others but under Wechsler’s unobtrusive but sensitive guidance, the play never turns static or talky." "...That kind of playfulness with theatrical form—self-conscious in a good sense, cerebral without being pretentious—is a hallmark of Moses’s work. Wechsler’s production isn’t perfect—the scene transitions are slow and clunky, and while Ally and Geraghty get close to their characters’ emotional cores, I wish they’d slow down and savor them a bit, rather than feeling as if they’re always speeding on to the next beat. But Moses’s insights into the tensions between supportiveness and competition are undeniably subtle and strong." "...The two become estranged. This clever plotted and smartly written play will grab you and make you laugh. Its realistic and plausible conclusion is most satisfying. It has been a while since a excellent ‘guy play’ has been so well acted. 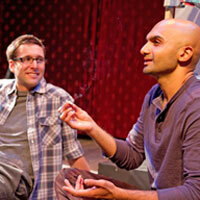 Usman Ally and Collin Geraghty’s stage chemistry made us believe they were the best of friends. This play hits home when one friend’s success threatens their relationship. Success and fame sure can kill a friendship. The Four of Us is a fine date night show and a worthy buddy play." "...This is a tight 90 minutes of flashbacks and stage appearances that unravel the real story of these two men ( and boys) and what happens between them as the years of camaraderie they had fall apart. We all strive for success and for the most part, we wish our good friends the same. But, deep down, if our best friend does better than we do, isn’t there just a bit of jealousy? No matter how great one’s successes are, it bothers us just a little when a friend surpasses our success with even greater success. In the press notes they refer to the relationship between these two men as ”frenemies”, a friend that because of specific reasons, becomes an enemy. In Moses’ story, in the play written by David, Benjamin is the one that changes dramatically causing the drifting apart, and of course, as a playwright, he has taken some dramatic liberties. Benjamin feels that he done nothing wrong, but is deeply hurt by the way he is depicted by his Frenemy, David." "...Playful scene changes and Joseph Fosco’s smart sound design keeps the energy lively from scene to scene. The Four of Us is fast-paced and cunning. Whether he digs theater or not, catch your best bud and drag him to see it. This is one of the most sophisticated comedies for the bros that I’ve seen in while. One can only hope that it will get made into a movie to wow the audiences at Sundance or Telluride."